I generally don’t give a damn about others. I don’t sit & criticize or bother ki how they look, what they are wearing, how they walk, what they talk, how do they commute to work. I don’t care if they use the public transport, like half of apna desh’s aam admi, or their own private SUV to get to work. In short, I don’t interfere in other people’s lives or judge them by the size or swell of their purse. And I don’t want others to care a damn about me. Bombay gives you that space. It lets you BE. I read once that Aamir Khan’s ex-wife Reena travels to work by the local train daily in the heavy Bombay traffic. The thing with Bombay is, it doesn’t care where you’ve come from or where you’re going. It’s only about what you mean to the person at that point in time & place. If you are polite & friendly, your bus mate or train mate is your friend for the day. Kal koi aur bhala aadmi milega. Bombay is also about not hiding things. I mean, people don’t take great efforts to push everything under the carpet. Every family has a skeleton in the cupboard. Yes, I’ve problems at work, yes, I’ve issues at home, yes I fought with my husband, yes my son flunked his test. So what? No pretensions. None of those “we are from a good family” drama, typical of Indian society. Everybody has a history. After all, like they say in Kannada, “yellar maney doseynu thoothey”. Translated in hindi, ‘sabke ghar ke dosay mein ched hai’. Everybody has a story he wouldn’t want others to know for fear of losing face. Also, most of them have struggled in life to reach where they have reached today. Some of them are still struggling. Some strive day in & day out to realize their ambitions in the city of dreams. Some isliye ki do waqt ki roti kamasakey. There is an unspoken, deeply felt empathy. Bombay is crowded beyond belief. Yet, it’s also the only city that gives you a lot of space. You can just be who you are. Most people are not judgmental. After all, they would’ve seen worse. And if some of them are, you wouldn’t care anyways. “Toh kya … sala who kaun hota hai puchne wala” is how it goes. I love that about Bombay. Let me make my mistakes. Don’t question me. Don’t correct me. You want to live an error-free, carefree (oops) life, go on. Who is stopping you? Just don’t meddle with mine. I’ve only one life to live. Live and let live. But strangely I wouldn’t want to go back & settle in Bombay now. The city has changed. The childhood memories have been erased. The people of my bachpan are no longer there. If some of them are still there, they may not be the same, maybe they wouldn’t even remember me, who knows. The Hanuman temple, the galli ke friends, the Jain ashram next to my house where the devotees always covered their mouths with a cloth, the tree lined streets, the bakery, the pan ki dukaan wala mama, the Jain hospital with the nurses in knee-length frocks, the nukkad mein khelna, ...it’s all over. People & places change. They take on a new character with time. They mean newer things to a whole set of new people now. Or maybe, the city hasn’t changed. Maybe I’ve changed. Maybe it’s my mind stuck in the past that’s unable to face the reality of today. The city, where I was born & played, holds a very dear place in my heart. And no matter how much wealth & recognition, the place of your livelihood gives you, you will always cherish the city you grew up in. Bangalore gave me an identity, money, marriage, career, & motherhood. Udupi/Mangalore gave me great education & a sense of direction & with it a desire to be the best of who I could be. But Bombay gave me my childhood. It has the images of my early growing up years, in the late 70’s & 80’s, permanently etched on its worn out pages. I am totally, irrationally sentimental about the city. Well said, Bombay also knows how to have fun, Bombay also knows how to stand united. yeah, me too, very sentimental about the city. I will always be the girl from Bombay no matter where I live. And, I agree the city gives you immense space, no showbaazi, everyone minds their own business. But, it is congested beyond belief now. In school and college I could commute for hours. Now, I am not sure. Maybe, I am growing old :) or my circumstances or patience levels have changed. 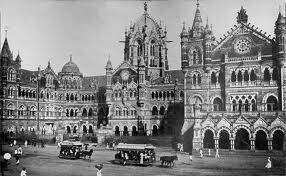 I can't reminisce about gali and nukkads but my South Mumbai residences, schools and colleges and our favorite haunts are places I can wax eloquent about hours. Good to know that both of us share this connect too, Sujatha. never been to bombay but agree to the saying sabke dose mein ched hai thing. incidently mario puzo (Godfather fame) also said 'behind every success there is a crime' . i consider myself the non interfering type. i feel weird when ppl ask me to comment about their lives and general issues. now that i am reading that line "sabke dose mein ched hai" in hindi it sounds funny. translations damn! :) from birth to the time i was 12-13 years old. after that we 'settled' in Udupi but kept going back every summer holidays. Hey ,it is like I have opened a treasure trove of goodread Sujatha!I loved reading this esp. because Mumbai is my jaan and for me it was reverse,many cities raised me but Mumbai made me ME.My ode to this city of dreams and I very shamelessly leave a link for you- http://sharmila-mymind.blogspot.in/2011/10/why-am-i-in-love-with-Mumbai.Wherever I go i come back to this city to seek anonymity in crowd.